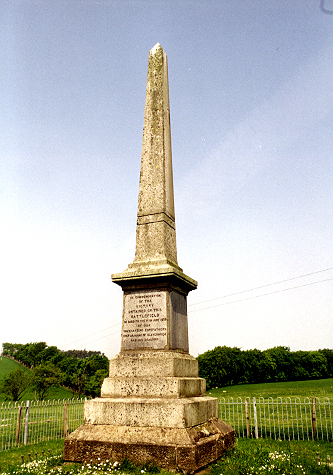 The monument stands on the site of the battle, just off the minor road that passes by Stobieside and High Drumclog. Much of the ground is now afforested. The monument is a replacement for an older obelisk of 1839 that was hit by lightning. A surviving fragment of the old memorial is located at Drumclog Parish Church. There is also a memorial to the battle on the adjacent cottage, formerly Drumclog School. Associated with the battle is the Trumpeter's Well. 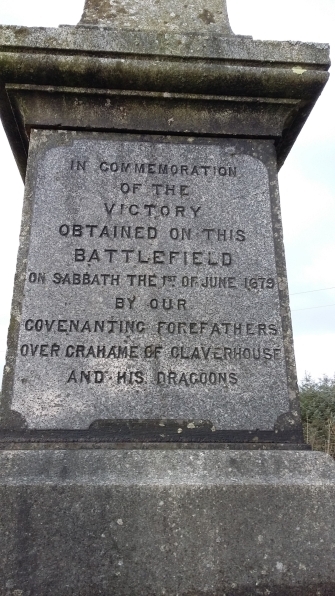 On Sunday, 1st June 1679, John Graham of Claverhouse (later Viscount Dundee), an arch persecutor of the Covenanters, attacked a large Conventicle being held at Drumclog, Lanarkshire. Many of the worshippers had come armed, and they resisted to such an extent that they routed Claverhouse and his dragoons. The euphoria following this victory was soon dissipated, for the authorities, alarmed at this open resistance, brought in a large Royalist army, which met a largish Covenanter force at Bothwell, exactly three weeks later. Despite initial success, the Covenanters were routed and very many were killed on the field of battle and in the ensuing flight from it. The persecution of the Covenanters continued and, if anything, conditions worsened when James VII (James II of England) succeeded his brother Charles II in 1685. The hundreds of Covenanter memorials to be found all over the south, west and east of Scotland bear witness to the many cruel executions perpetrated upon the populace. Some are to be found in kirkyards, but many more are in the hills and woods, where these martyrs were hunted down by the royalist troops. The great majority of those inscribed memorials bear the key word "adherence" (to the Covenant and to the Reformation). This in our opinion is the indication that these particular martyrs were given the opportunity to take the oath, but declined, knowing full well that a refusal would probably result in immediate death by shooting. The Drumclog Memorial and immediate surroundings were renovated in summer 2018 by Stewarton Memorials, with funding and support from the War Memorials Trust, Scottish Covenanter Memorials Association and South Lanarkshire Council.